1. When we create text using pen and paper (or a typewriter) these traditional methods normally lead us into a linear writing strategy. That is, we are likely to generate what we have to say in a sequential manner. We write down a few words to start a sentence, then try to find the next words which will complete the idea we have in mind. Items are added until the statement is completed and the sentence is brought to an end. But very often we become ‘lost for words’, and the process comes to a halt in mid-sentence. This is the condition in which so many pencil ends are chewed, or paper is wrenched out of the typewriter. We stare at the blank sheet, wondering what to say next. There are often long and frustrating pauses when we are stuck in this way. 2. It is very common for people to adopt this approach to writing in which a second sentence will not be started until the first is finished. At each pause, the whole creative process comes to a halt. We may even have ideas about what we wish to say later in the piece of work, but it isn’t easy to get these ideas onto paper. Instead, we are left searching for an appropriate word or wondering how to complete the current sentence. 3. Of course, there are exceptions. Some people have the intellectual strength to defeat temporary blocks. They go to another part of their text which is already outlined, then return later to the point where they left off. [This is one of the advantages of working to carefully designed plans.] However, such approaches are usually adopted only by the most confident and experienced. We know from the example of even prolific novelists that the source of fluency can easily dry up. 4. For less experienced writers, these alternative strategies might create even more problems than they solve. If your basic approach to writing is simple and linear, jumping to a new section of text is difficult. How big a gap should you leave? What are the arguments or the discussion that will eventually fill the space? The ability to move from one part of a text to another (particularly if it is not yet written) requires a confident grasp of its structure. Remember E.M.Forster’s dictum: “How can I know what I mean until I see what I say?” You could of course just move onto a new sheet of paper, then fill any gaps later. However, these are not writing skills possessed by many beginners. 5. These difficulties associated with linear writing can sometimes be reinforced by two popular notions which inhibit fluency. One is that we shouldn’t waste paper. Many people think the blank page in front of which they first sit down to write will be the one which is submitted as a final draft. Many students, for instance, have the impression that they should be able to start writing in the top left-hand corner of a page, then produce sentences with as few mistakes as possible until an essay or report is finished four or five pages later. The proof of this can be seen when they make a mistake. They tear the page out of their writing block with an exasperated flourish, and start writing again – copying out what they have already produced. 6. The other very similar misconception is a belief that writing is one single act which results in the finished product – rather than a process or a series of stages in the generation of a text. As children and students we are not usually taught that successful writing is the result of a number of drafts. Indeed, some people even have the impression that they should be ashamed of crossings out or amendments to their texts. Yet these represent redrafting and editing – two of the most useful writing skills. 7. I’m not suggesting that everybody has these problems – just that they are very common. There are some writers who can move confidently around a document, working on different parts in succession. 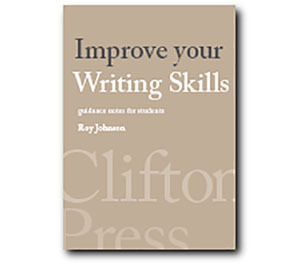 There are even a gifted few who can produce a reasonably fluent text in just one draft. But there are many, many more who out of habit or necessity can only work on one section at once, and who produce their text in a linear sequence of sentences. These habits, strategies, and misconceptions can cause a fear of the page which impedes all but the most confident. 8. After that slightly gloomy outline of common problems, here comes the good news. Word-processors have the power to help you overcome these obstacles. We have already covered some of the most useful facilities and menu items in earlier chapters. Functions such as CUT and PASTE will give you a mechanical purchase over your text which should make writing easier. Moreover, these facilities create the possibility of new attitudes and approaches which can release you from the drawbacks of a linear strategy. They can provide you with the revolutionary tools to produce what I am calling electronic writing. 9. 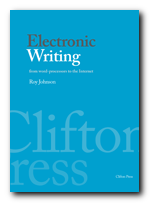 In his seminal work “Writing Space”, Jay Bolter observes that the technology available for the earliest forms of writing meant that text was physically very permanent. It was produced with chisels on stone, then later inscribed onto animal skins and parchment. Obviously, given such materials, every letter would be recorded very carefully. The text was fixed permanently. Later, with the invention of paper, the text became more susceptible to change and revision, but hand-made paper was a fairly precious commodity and any text put on it would not normally be changed. Even following the invention of printing, writing was made permanent on the page. Changes to a printed book are still very costly, once the type has been set up. 10. These observations point to the interesting relationship between technology and writing. Carving in stone is hardly suitable for casual messages: it was reserved only for permanent inscriptions of a socially important nature. In the earlier stages of text technology, when books were produced by hand (as in the case of medieval manuscripts) a book might be regarded as a unique record. Any copy would take as long to produce as its original. Even with the arrival of printing, only important texts would be produced. [It’s significant that Gutenberg is probably best known for his Bibles.] And of course these books were expensive, and well beyond the reach of ordinary people. 11. But now the advent of the computer makes possible a whole new relationship between writer and text. The word-processor allows us to adopt completely different approaches to writing. Horizontal and multi-level strategies of addressing the text are now possible which offer an alternative to linear writing. The text is being stored as a series of electronic signals, and our writing is in a state of impermanence, only becoming fixed [hard] once we send it to the printer. Because of this impermanence, because the text is stored in digital form, it can be easily manipulated using the tools of the word-processor. We will deal with the technical part of this in a moment. First, let’s go back to the keyboard to look at the new possibilities at a practical level. 12. For instance, when we come to one of those pauses in the expression of an argument or an idea, there is no need to remain stuck. The sentence can be left unfinished. We can move onto something else, then return later without effort. True, this can be done when writing or typing on paper, but the process is much easier on screen. You don’t need to worry about how much space to leave, because the gap will be filled later. You can leave a gap or use CUT and PASTE. The word-processor will automatically reassemble the text as many times as needed. Moreover, it will be reassembled in fully justified form, with all irregularities removed. 13. This freedom to generate text in whatever manner you wish can be very liberating. It is certainly common for people to report an increase in production rates as soon as they become comfortable with a word-processor. Even the two-dimensional space in which we write – the edit screen – can be regarded as an environment we can manipulate. We can ignore all notions of spacing, positioning and calculating what gaps are to be left. A whole new idea can be generated on the very next line – indeed, even one idea within another! – and then lifted to its most appropriate position later. 14. Writing with a computer also gives you the ability to record your thoughts in whatever order they might occur. If I think of an idea which belongs in another chapter of this book whilst I am in the middle of writing this sentence [Don’t forget to remind readers of the aesthetics of good layout] I can write it down then move it to the appropriate place later. This process may be a close approximation to the way our minds work. After all, ideas are not necessarily produced sequentially, with the logic of their development ready ordered. Our minds often work associatively, according to random suggestions. How often have you had a bright idea whilst doing something entirely unconnected with it? When using a computer, these sudden or unattached thoughts can easily be noted – then transposed to an appropriate place at a later date. The human mind … operates by association. With one item in its grasp, it snaps instantly to the next that is suggested by the association of thoughts, in accordance with some intricate web of trails carried by the cells of the brain. 16. Bush was in the process of describing what is now known as Hypertext, which we’ll consider in the next chapter. It is also interesting to note that the latest theories of language acquisition posit this notion of genetic programs which work on a ‘snap to rules’ basis. The point to be made here is that it is the technological development of the computer and the word-processor which provide the means to harness these associations. The combination of digitized text, electronic storage [memory] and extremely fast processor speed make it possible to juggle whole blocks of text as if they were single words in a sentence. 17. Using a word-processor, you can even work on more than one section of a text at the same time, or compare different versions of the same piece of writing. By using a split screen or opening multiple windows, it is possible to switch from one part of a text to another. You can deal with the same topic in closely related materials (separate drafts of the same materials, for instance) or switch to a different topic whenever you feel the need for mental refreshment. These strategies may only be suitable for experienced writers, but the word-processor makes such facilities available in a form which can be qualitatively different than writing on paper. 18. For instance, when revising on paper any second thoughts cannot be incorporated directly into the text: they normally exist as marginal additions or deletions. Revising electronically however, using split screen or multiple window techniques, you can see a clean copy of your text in both its original and its revised form. This allows you to choose between them. Using CUT and PASTE you can construct a version which combines the best parts of each. 19. There are some writers who argue that revising on paper offers one advantage. To do so means that you have a permanent record of your first and second thoughts, with both ideas in view at the same time. The paper version for such people becomes a palimpsest, a record of revisions ‘just in case’ there are reversals of decisions at a later date. [This might appeal to poets, for instance.] When editing electronically you are probably more likely to discard earlier material.